VANCOUVER, Wash. (AP) — The school year has been delayed for more than 75,000 students in southwestern Washington state after teachers and districts failed to reach contract agreements, mostly over salaries. Teachers in seven school districts were on strike Wednesday, according to the Washington Education Association, which represents state teachers. The walkouts come after other educators around the country have risen up to demand better teacher pay. The movement started earlier this year in West Virginia, where a strike resulted in a raise, and spread to Oklahoma, Kentucky, Colorado and Arizona. More walkouts were possible in Washington state as teachers unions and the districts try to negotiate salary agreements. Educators in Seattle — the state’s largest school district — voted Tuesday to authorize a strike unless a deal is reached by the time classes are set to begin on Sept. 5. Unions representing educators in other cities have also authorized walkouts. Several dozen districts have already reached agreements on teacher pay, many with double-digit percentage increases, said Rich Wood, a Washington Education Association spokesman. Teachers in most of the state’s 295 school districts opened contract negotiations in recent months after the Legislature in March approved an additional $1 billion for educator salaries during the upcoming school year. The Legislature in 2017 also included about $1 billion over a two-year period for salaries, starting this year. The state had been under a Washington Supreme Court order to fully fund K-12 basic education. In late 2017, the court ordered the state to speed up its school-funding plan to meet a Sept. 1, 2018, deadline, and lawmakers responded with the additional money. Local unions representing teachers have said districts now have the money to give teachers competitive salaries. But some school administrators have said they also have to balance that with the need to provide other services. In Vancouver, where teachers in two districts are on strike, dozens of teachers and supporters wore red and lined a street near a high school waving signs, The Columbian newspaper reported Wednesday. The Vancouver Education Association representing the city’s teachers said the union proposal would use money sent from the state specifically for salaries and does not negatively impact students. 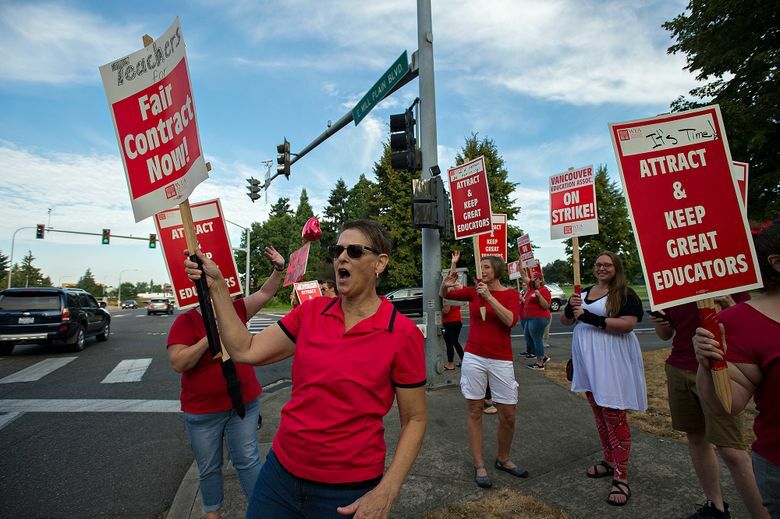 Teachers in Longview, Battle Ground and Ridgefield are among those on strike.